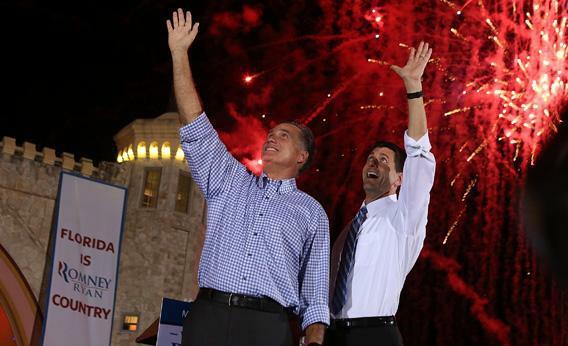 Mitt Romney and the GOP’s plans to woo Florida Jews from Barack Obama appear to be going nowhere. It turns out it’s not much of a battle after all. Mitt Romney and Paul Ryan in Daytona Beach, Fla.
WEST PALM BEACH, Fla.— On the flight into Fort Lauderdale’s airport, if you look to the right of the plane, you see the first billboard: “Friends Don’t Let Friends Get Nuked. STOP OBAMA.” A cartoon map of Israel, colored white and blue and decorated with a Star of David, is being hit by an ICBM. On I-95, the route up to the heart of south Florida’s Jewish heartland, you see more signs in the same garish colors portraying the president bowing to a Saudi prince. The billboards are paid for by the American Principles super PAC. A photo of the one I saw led a spooky New York Times story this week as an example of the “strident messages” arriving in swing states. It’s also an example of how the noise of this campaign outmatches the signal. The PAC has reported only $126,000 in funds and handed most of it over to CBS Outdoor, the billboard company. Emails to its official address bounce back; phone calls to their offices ricochet off a full file of voice mail. The campaign to turn nervous Jews against Barack Obama’s Democrats might turn out to be a bust. And after such high hopes! The president’s relationship with Benjamin Netanyahu has been one long Adam Sandler movie of pratfalls and accidental insults. In July, a Gallup poll gave Obama a meager 64-29 lead among Jewish voters. It was, as the Palm Beach-based Newsmax pointed out, the worst Democratic showing since Michael Dukakis. A result like that could’ve meant tens of thousands fewer votes for Obama in Florida, Pennsylvania, Ohio, and Nevada. But it didn’t last. A mid-September Gallup poll, obtained by Buzzfeed, gave the president a 70-25 lead with Jewish voters. That’s about what he won in 2008. In the final presidential debate, Mitt Romney only mentioned Israel after the president brought it up and then said, “I think the tension that existed between Israel and the United States was very unfortunate.” In general, he went lighter on the issue than in past foreign policy speeches. “I thought, “Wow, he must be confident about winning Florida,” says Ana Navarro, a Miami-based Republican strategist. “He left a lot of Israel on the table. He left Cuba on the table.” She mentions another billboard campaign, by the better-funded Republican Jewish Coalition, which has spent at least $4.5 million in the general election stretch on ads that show purportedly disappointed Obama voters on silly pun-filled billboards. “I don’t think those OBAMA? OY VEY! signs were swaying many people,” says Navarro. Democrats—who, let’s be fair, have been spinning this for years—argue that Obama was already winning the argument and used the debate to spike the ball. Romney’s trump card on Israel was that Obama failed to visit Israel on his Middle East tour, and Israelis noticed. “I went to Yad Vashem, the Holocaust museum there, to remind myself the nature of evil and why our bond with Israel will be unbreakable,” said the president. “And then I went down to the border towns of Sderot, which had experienced missiles raining down from Hamas.”* He talked about the military exercise team-ups between the two countries and the Iron Dome defense system, and the round was over. The battle for Florida’s Jews is best seen from the new 22nd Congressional District, a long swath of small cities and suburbs that stretches from the Palm Beach area down 60 minutes south to Fort Lauderdale. For two years it’s been represented by Rep. Allen West, ever since he humiliated Jewish incumbent Democrat Ron Klein in the Tea Party wave. Then the state tweaked the district and moved some conservative suburbs into other districts. The new 22nd had given 57 percent of its vote to Obama in 2008. West jumped to the 18th District, packed with conservatives who struggle to describe how much they adore their new congressman. This forces the 22nd to choose between Democrat Lois Frankel and Republican Adam Hasner. Both are Jewish. Both were born in New York. Hasner came to Florida with his family in 1975; Frankel arrived in 1974. The Democrat, who’s 64, was elected mayor of West Palm Beach after leading the party’s diminishing delegation to the state House. Hanser, 42, helped Marco Rubio run the growing Republican majority. She spent half the campaign running against West; Hasner spent half the cycle running for U.S. Senate. And now they’re in a race where the Israel issue is a wash, hard for a Democrat to lose. It’s a dodge, and it sort of works. Frankel’s so happy with it that she repeats the line when I join her on a tour of West Palm Beach. It’s only the top of the district, but it is populated, to an eerie degree, with people who know “Lois!” by name and ask her if she’s won yet. The city library, built during her tenure, is decorated with her own abstract paintings. She frequently puts her hand on my shoulder and points out what’s “awesome”—the computer room, the new downtown restaurants, the park where the old library used to be, the wine bar owned by her son. She bluntly explains that she’s going to win the non-West Palm Beach parts of the districts with her TV ads and that the Israel issue’s a wash.
And in a short interview, when I ask about Israel, Hasner mostly moves on. “I don’t think the Jewish vote is atypical,” he says. “I think President Obama has lost support across the spectrum. I think Jewish voters are right in line with re-evaluating their support based on a multitude of issues, including the economy.” Indeed, in Hasner’s latest ad, a woman tells voters that Frankel spent $13,000 to remodel a bathroom then flushes the toilet she’s sitting on. “When you gotta go,” she says, “you gotta go.” It’s not quite a nuclear missile headed at Tel Aviv. Correction, Oct. 25, 2012: This article misidentified the town Obama said he visited in Israel. It is Sderot, not Storok.